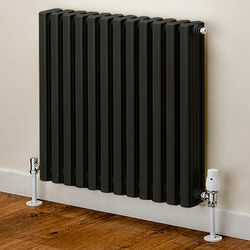 EcoHeat Woburn > Horizontal Aluminium Radiator 568x620 (Black). EcoHeat Woburn column style horizontal aluminium radiator with wall brackets in jet black (568x620mm). Italian designed and built to the highest standards. Low water content with high thermal efficiency. 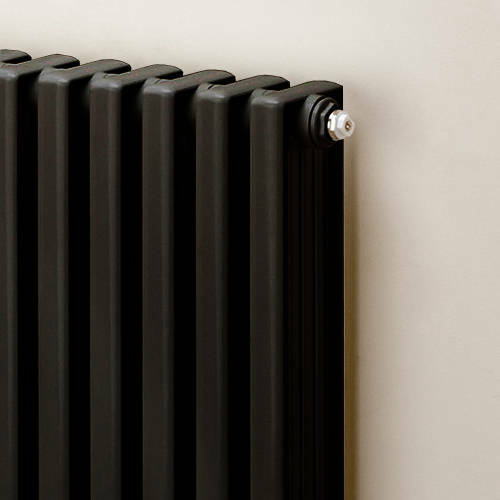 Aluminium radiators have high heat transfer capabilities and are fast to respond to changes to the rooms heat requirements. Requires less heated water from a Boiler or Heat Pump. Ideal for Geothermal systems, Air To Water Heat Pumps and Water To Water Heat Pumps. Suitable for standard and condensing oil and gas boilers. Suitable for standard and TRV valves (sold separately). Finish: Jet Black (RAL bespoke colour). Also available in a choice of 25 different RAL colours (sold separately). Size: 568H x 620W x 95D mm. Pipe centres left to right: width of radiator plus valves. Pipe centres from wall: 70mm. Maximum operating pressure: 6 bar (test pressure 9 bar). Connections: 1/2" flow and return. NOTE: This is a special order colour. Please allow 20 days for delivery. EcoHeat Woburn range of luxury aluminium radiators will add modern energy efficient technology to your home with a timeless traditional style. Ideal for new and retrofit plumbing installations of all Central Heating systems including Geothermal Heating, Water to Water and Air to Water Heat Pump. 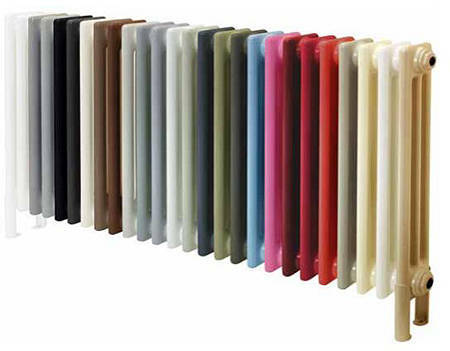 Available in a choice of 26 RAL colours you a sure to get that perfect look. Heat Pumps provide domestic space heating and hot water, it is possible to greatly reduce your CO2 emissions and your home’s running costs. These heating systems use naturally occurring energy from the air, water or earth to provide domestic space heating and hot water. Heat pump technology has been used around the world for decades and is the Eco heating solution for the future.